Is your Scouting Unit Chartered by a Catholic Parish or Catholic organization like the Knights of Columbus? That means you’re by default a Catholic Unit and many, if not most of your Scouts and their families are Catholic. The decision to charter a Scouting unit may not have originated as a form of youth ministry, but more than ever before the Church considers Scouting a form of Youth Ministry. The values of Scouting and the faith are complimentary in every way; promoting service to others, duty to God and stewardship of our natural resources. But what makes a Catholic Unit other than its Chartering Organization? That is where leadership on the part of the Unit Committee, leaders and parents come in. Here are 5 ways your Unit could put the “Catholic” in Catholic Scouting. The BSA maintains that “no member can grow into the best kind of citizen without recognizing an obligation to God.” The chaplain aide is an approved youth leadership position in Boy Scout troops and is a member of the Patrol Leaders Council. This is a role for a mature Scout with duties that include preparing and leading interfaith prayer services, encouraging individual prayer and duty to God in the patrols, and perhaps leading the scouts in prayer at a unit meeting or before meals. The Troop Chaplain is the adult leader who peppers all unit experiences with elements of faith – whether coordinating religious services, acting as a spiritual director or promoting religious emblem programs. It’s not likely we all have a priest camping with us on weekend camp outs. But there is a high likelihood you’re in proximity to a Catholic Church regardless of the small town or state park in which you pitch the tents. Prior to an outing, the Chaplain Aide can search on www.masstimes.org. Simply type in the zip code of your location and you get area parishes, mileage from your location and the weekend Mass times. By putting Mass on the schedule, the leaders show by example the importance of faith and the obligation of Catholics to keep holy the Lord’s day. 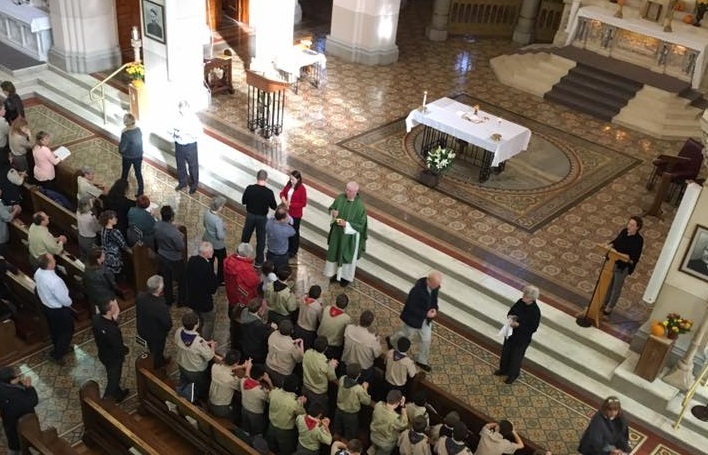 There are also positive aspects of attending Mass as a unit – exposing the Scouts to a Church larger than their home parish and the affirmation the unit receives often directly from the priest and the parishioners. Don’t be surprised if Scouts are asked to bring up the offertory gifts, act as ushers, or even serve at the Mass! Should you find yourself an unrealistic distance from a Church, consider when you strike the tents and if you could return the unit to the parish for the last Mass on Sunday or an evening Mass at neighboring parish back home. Just because we’re camping and away from home does not mean we’re also on break from our obligation to support the Scouts in their faith. Catholics should be encouraged to pray always, whether in words or in actions. Start or end a Unit meeting with a simple prayer led by the Chaplain Aide. Or pray as a group before traveling to and from an outing. These prayer opportunities reinforce the faith and stir the spiritual life of the Scouts, helping them to learn to rely upon God’s providence always. Turn to memorized prayers such as the Our Father or Hail Mary, but prayers for any occasion can be found through a simple web search of Catholic sites. Scouting Units share the responsibility of preparing food together and cleaning the patrol site after meals. Eating together promotes unity of the patrol and camaraderie between individuals. Praying before meals is an opportunity to express thankfulness to God for the day and for the food to be shared. There are numerous Scouting prayers available for before meals – some rhyme, some are funny, some of inspirational. Consider preparing a prayer sheet to keep in each patrol box. The patrol leader could assign a different Scout to lead the patrol in prayer before each meal. In a Catholic Unit, religious emblems should be as normal as the pledge of allegiance. In Cub Scouts the Emblems include The Light of Christ (Tigers and Wolves) and Parvuli Dei (Bears and Webelos). These are family-led activities done at home between the Scout and their family members. Cub Scout emblems are awarded at an annual Scout Sunday Mass or a special ceremony like Blue & Gold dinner. Boy Scout Emblems are Ad Altari Dei (age 13+) and Pope Pius XII (age 15+). The Boy Scouts emblem programs require a trained counselor or facilitator and the programs are completed over several months. See other blog posts for greater detail on these emblems. These are just some of the ways your Catholic Unit can practice our Duty to God. Does your Unit do something different or additional? We’d love to hear your practices and suggestions to put faith into practice. 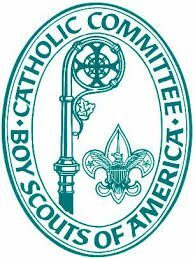 I wish there were more Boy Scout Leaders who practice their Catholic faith by having a Troop Chaplain, Chaplin’s Aide, celebrating Mass while camping, saying prayers at Troop meetings, saying grace before meals at campouts, encouraging religious emblems for all faiths, and encouraging their Scouts to attend Sunday Mass regularly. It’s an uphill battle with parents, especially Catholic parents, who believe in a complete secular society.